Tattoos have long been popular, and a recent discovery shows that the use of the figural variety in Africa dates back roughly 1,000 years longer than previously known, reports the BBC. Images of what are believed to be a bull and a Barbary sheep were found on an approximately 5,200-year-old male mummy that has been housed at the British Museum for roughly a century. The Guardian notes that the dark patches had been thought to be nothing more than spots, but analysis revealed they are, in fact, intentional markings. Their symbolism is unknown, but it is suggested that the animals were chosen as a show of virility. tattoos observed on his right arm under infrared light. Lower right: The mummy and tattoos under normal lighting conditions. Detail of S-shaped tattoos on Predynastic female mummy from Gebelein. and a man holding a curved implement. 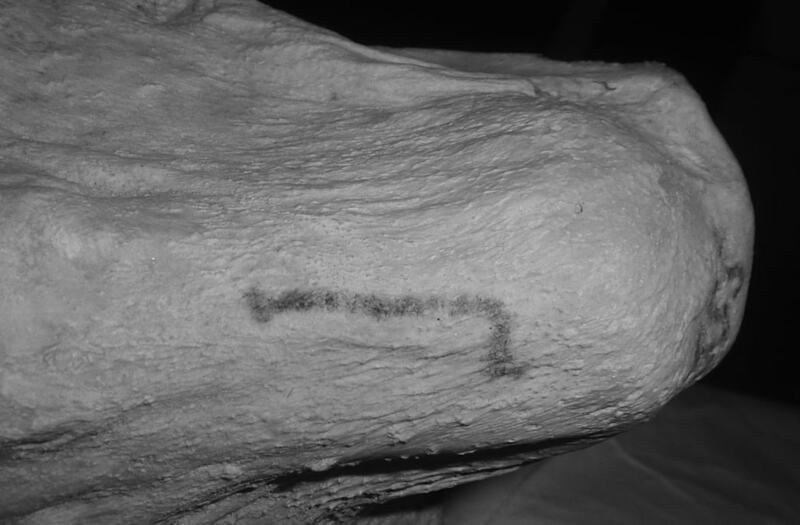 Detail of stick-shaped tattoo on the right arm of Predynastic female mummy from Gebelein. Analysis of dark areas on a female mummy recently confirmed as tattoos as well, but the designs are more abstracted. The small, s-like marks are suggested to have been a show of position in the community and perhaps identified the woman as a person of authority. The tattoos are the oldest ever found on a woman, notes The Independent.